SAN RAMON (Chevron press service) — Chevron said Thursday it will hike its 2019 capital spending by 9% up to $20 bln with major focuses on West Texas’ booming Permian Basin and the massive Tengiz oil field in Kazakhstan. Tengiz and Korolev are located about 10 km)east of the Caspian Sea. Chevron said it will dedicate $3.6 bln to the Permian, but the largest chunk will actually go toward the ongoing Tengiz expansion in Kazakhstan’s largest field with a $4.3 bln instalment. Wirth said Chevron will spend $7.6bsp;bln on exploration and production in the U.S., including the Permian, with $9.7 bln on international production, including Tengiz. Deep beneath the western Kazakhstan steppe the giant reservoir of Tengiz Field, where the oil column measures an incredible 1 mile (1.6 km) across. 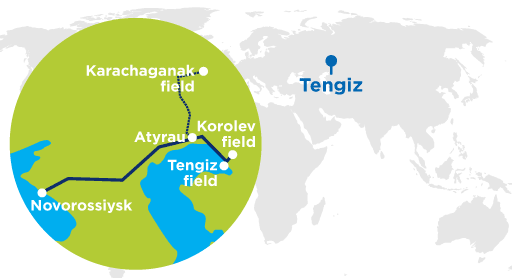 With a surface area more than four times that of Paris, France, Tengiz ranks as the world’s deepest producing super giant oil field and the largest single-trap producing reservoir in existence. Nearby is another world-class reservoir called the Korolev Field. Chevron holds a 50% interest in Tengizchevroil (TCO), which operates the two fields.